Michael J. Gelb, Author of How to Think Like Leonardo da Vinci and The Art of Connection: 7 Relationship Building Skills Every Leader Needs Now. The effects of globalization influence corporate life and entrepreneurial culture and the implications are felt, directly or indirectly, by every world citizen. This book examines our inevitable relationship with business and the drives behind the way we do business. In a nutshell: ‘me and mine’ or ‘thee and thine’. The former ends up in a cul-de-sac of individual and collective emptiness, alienation and self-destruction. The latter involves a transformation in the way we do business and leads to such benefits as collaboration, mutual enrichment and our livelihood being an integral part of our quest for a meaningful and fulfilling life. 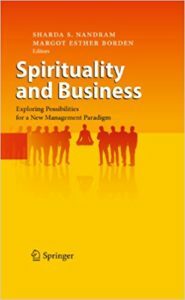 Spirituality is presented in this book as a possibility for providing a non-denominational inspiration and framework – both in theory and practice – for bringing about an inner transformation resulting in a new paradigm for business and management. To learn more about the book, watch the video. Click here to purchase Spirituality & Business.